Is this the year you finally run that 5k? Maybe lose those extra pounds? Perhaps try kayaking for the first time? Travel to Paris? Whatever your hopes and goals may be for the new year, the most important thing to remember is to take that first step. It’s never easy to start something new, especially after years and years of a certain lifestyle. You’ll find though, with a little effort and some determination, we adapt to new things fairly quickly. So in light of the new year, and because getting back into shape is always high on everyone’s resolution list, I thought I’d pass along a few helpful tips to keep in mind as you start your new journey. 1. Start small. If you want to get back in shape, running a marathon isn’t the best place to start. Try taking the stairs once or twice per week instead of riding the elevator. Maybe you can shovel the driveway instead of breaking out the snowblower the next time we get a dusting of snow. Heading to the gym isn’t the only way to get started on your path to feeling great, and there are tons of ways to get yourself in the mindset of leading a healthy lifestyle, oftentimes without spending a single dime. Just remember – diving in head first seldom works for most people, and will quickly leave you overwhelmed. 2. Be honest with yourself. If you’ve never held a tennis ball, planning to win Wimbledon later this year might be a stretch. The same goes for your goals, and it’s ok if you don’t know all the answers right away. Change doesn’t happen overnight, and going into a new goal or resolution with hopes too high will almost certainly result in letdown. Want to lose 20 pounds? Start by losing five and go from there. Reaching that first goal will provide a sense of accomplishment and great motivation to lose the next five pounds. Keep in mind that everyone who has ever achieved anything first had to start at the beginning. 3. Educate yourself. An old coworker from a former job had a sign hanging above her desk that read “Fail to prepare, prepare to fail.” Without the proper knowledge, you’re far more likely to not find success in your new endeavors. Just as you wouldn’t leave on a cross country road trip without a map, you shouldn’t start a new goal without a good plan. There are tons of free resources available today to help you find the answers to your questions, and our staff is a great place to start. Made up of outdoor sports enthusiasts of all ages, we’re eager to help with any questions you may have. Remember, it’s often the small, simple changes that produce the greatest results! We wish you the best of luck with your new resolutions in the new year! If you’ve read Weird Wisconsin, taken a downtown ghost tour, or done any personal research, you might be onto the rumor that Shep’s is haunted. Some staff members have had “encounters” with the ghosts, some haven’t seen or felt anything at all. What we do know is that the “Shepherd & Schaller is haunted” message keeps us on our toes around here! A paranormal group from Stevens Point came to the shop this summer, along with Wendy, a medium from Minneapolis. Take a look at Wendy’s recap of the night here. If you’re into ghost stories, you’ll probably like her writeup. We’ll leave you with this photo, and you can make up your own mind. 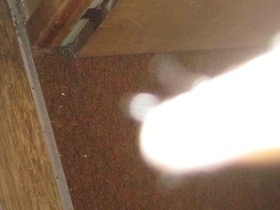 Their camera caught what looks like a vortex in our stairway. Photo taken from http://www.stevenspointparanormal.com/. Author RachelPosted on October 30, 2012 Categories UncategorizedTags Ghost Stories, Hunted Shepherd & Schaller, Shep's ghostLeave a comment on Shep’s is HAUNTED?